A slightly voyeuristic photograph, this is from an old lodge hall that was being converted to a residence. It's located in coastal Maine, a great location for all sorts of photography. Also an awesome composition! Did you use any special filters to get the stairs behind the window so clear? The stairs look like a framed picture within the window itself. love it! It's very hard to give sensible advice when I can't play with a picture myself and see what actually works. Something about the exposure, overall, sits oddly in my eye. If it were my picture, I think I'd experiment with giving the outer boards and the inner stair sides slightly different exposure values. I guess my own personal taste doesn't respond to the overall sameness of the whiteness or greyness. It makes the picture seem too flat. If you want to emphasize the voyeuristic feel, flatness isn't what you want, IMO. 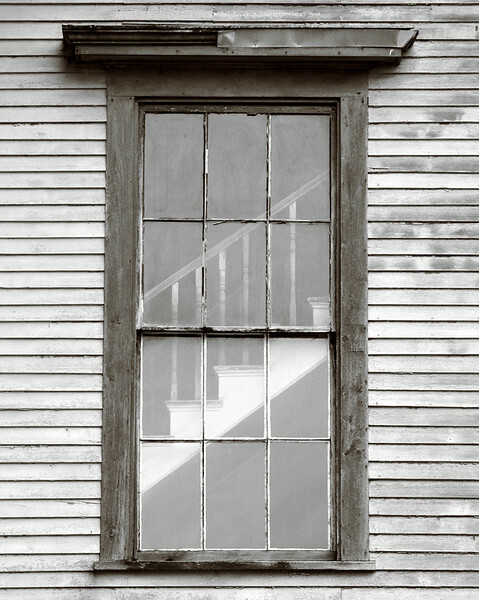 First of all this is a wonderful photo fine...I love window frames but what I like most about this one is the stairway that is visible through the window. Sorry I don't have any suggestions on how to make it better but I guess that could be considered good.